Post #300! A Pahoehoe Party! It's my 300th post! In celebration, I am throwing a pahoehoe party with some pictures from our recent Hawaii field studies journey (and one older picture from the pre-blogging days). If you have been following my last few posts, you have learned a bit about the current ongoing eruption of Pu'u O'o on the flank of the Kilauea volcano on the Big Island of Hawai'i. The flows have continued unabated for more than two decades, starting in 1983. 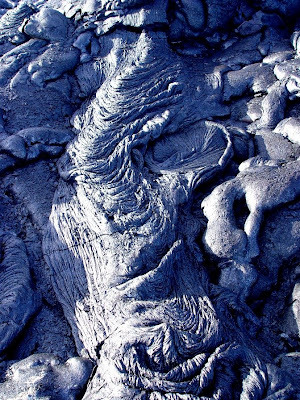 Pahoehoe is a term used by the Hawaiians to describe lavas with a smooth shiny surface, that reminded them of shark skin. We were lucky enough on this trip to witness a number of breakouts from the lava tube system that were forming pahoehoe surfaces. 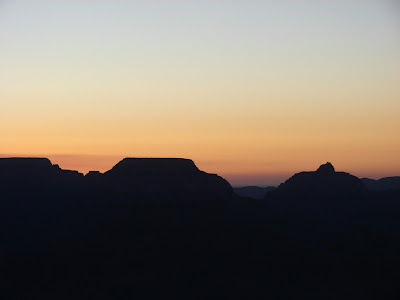 They were far up on the pali, and best viewed in the evening twilight, as can be seen in the top photo. Our view the next day was astounding, as our helicopter flew right over the breakouts just 1,500 feet above. The center photo shows the active breakouts, with the main lava flow snaking along the right side of the picture, and two breakouts at the top and bottom. Despite the bright sunlight, the orange glow of the lava can be seen in places. 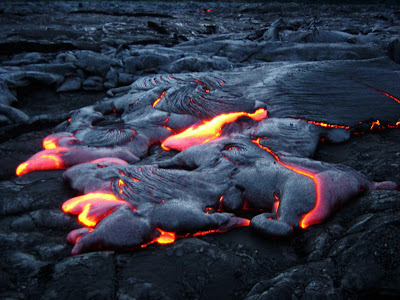 The shiny, silvery appearance results from the thin coating of glass on the surface of the lava where it cools first. It is a blasted hellish surface. We didn't have a chance to stand next to an advancing flow, but in 2002 I was able to get a photo of the front of a lava stream on the coastal plain. The lumpy surfaces expand as they fill with the hot basalt and then the lava squeezes out the edge of the bulbous masses. It is hypnotic to watch, and there is little to fear, since the only way it will get you is if you stand really still and let it surround you (for all I know, this is how some photographers I know will buy the farm!). More details to follow about the Pu'u O'o flow, but going through my pictures, I discovered that I had a single shot that included the entire flow from start to finish: the copter was flying east of the flow, so Pu'u O'o is where the massive steam plume is rising on the right, while the Kalapana ocean entry is visible on the far left. The series of cliffs and rises are the palis, or fault scarps generated by slippage of the volcanoes towards the sea along major fault systems. 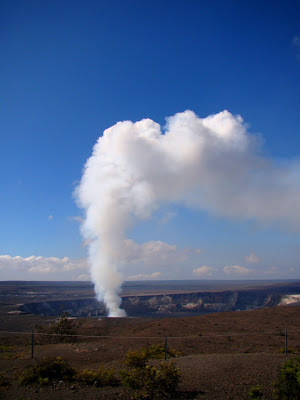 Smaller steam plumes are vents and windows over the lava tube system, and the occasional surface flow. Note especially the pattern of forest islands, called kipuka. They are important biological refugia where some native species are protected from invasive predator species. Pele's March to the Sea: Taking the Subway! The lavas of Hawaii's Pu'u O'o emerge at the East Rift Zone around seven miles from the sea, and yet most visitors to the volcano only see lava pouring into the sea. Where are all the fountains and rivers of lava that grace every single tourist brochure about the islands? Well, it is not always dramatic that way, even though the eruption is the longest continuous eruption in recorded history. Most of the time the lava is flowing to the sea in lava tubes, a few feet beneath the surface where the lava has crusted over. The rock is an excellent insulator, so the temperature drops only a few degrees over the seven mile journey down the volcano. Sometimes no lava is really ever seen at all, but we were quite lucky with our timing. 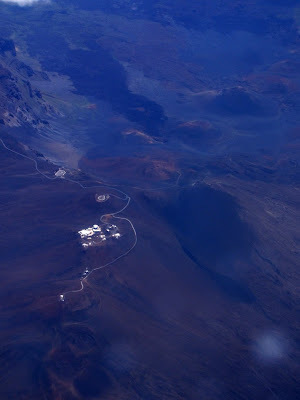 As we flew over the Pu'u O'o cone we could see the numerous vents and windows marking the location of the tube system. At times lava breaks through to the surface forming miniature shield volcanoes called rootless shields (that's one of them in the foreground of the picture). The perspective of the picture is a bit difficult to perceive: I was flying right over the Pu'u O'o cone looking downslope towards the sea. The steam vents mark the downhill location of skylights in the lava tubes before they disappear over the pali, or coastal cliff. In the far distance are the two ocean entries at the coast, with the Pacific Ocean beyond. Flying closer to the vent of Pu'u O'o, we were able to look at the steam and sulfur dioxide emanating from the cone. No lava has been visible here for a few months, but it is there, traveling down the cone through lava tube systems. 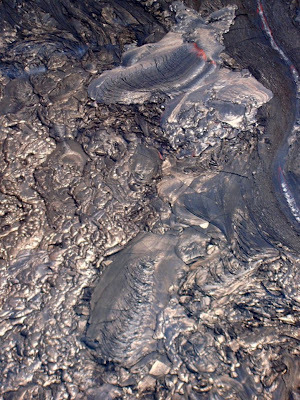 In the foreground of the lower picture, one can see the very fresh pahoehoe flows. They are silvery in color because they have a thin coating of glass. On the older surface, oxidation has removed the glass and given the rock the prominent reddish brown color. It is a ghastly landscape! Accretionary Wedge #17: Caught in a time warp! Lockwood has graciously consented to host the new Accretionary Wedge, and asks where we would want to go in the geologic past with a time machine. I could imagine many moments, including some from childhood (I really wanted to see living dinosaurs), but I come back to one thing: I think I most would like to see the moment the Grand Canyon began! One could argue that it didn't just begin, but some imaginative hypotheses have been suggested over the years that include some form of stream piracy, where a Colorado River once flowed elsewhere, possibly into the Gulf of Mexico, or points northwest in the Basin and Range. 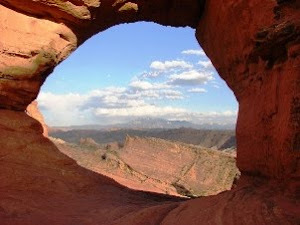 A separate drainage system related to extensional stresses to the southwest evolved which eventually captured the river, and from there the giant canyon was carved in just a few million years. I have many times imagined seeing that first trickle of water that spilled over the low divide, and how it would have become a torrent, and within hours the work of building a new canyon would have begun. Whether the hypothesis is correct or not, it is a wonderful piece of work for the imagination! 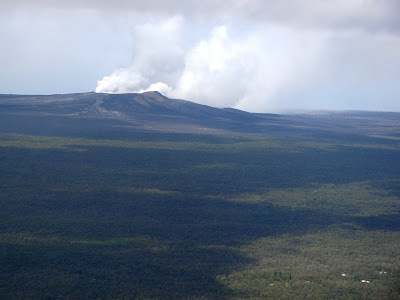 Pu'u O'o is a vent on the eastern rift zone of Kilauea volcano on the Big Island of Hawai'i. It is, and has been the focus of most of the volcanic activity of the last 24 years. I've been on the big island three times now, and until the other day I had never seen the source of all the lavas that have brought great interest and great misery to the region. 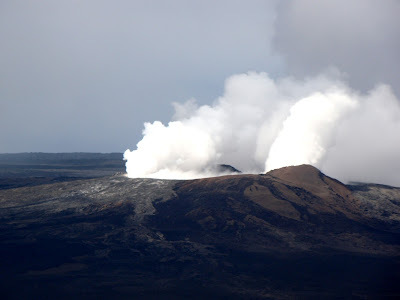 The problem is that being a shield complex, the slopes of the volcano angle away from the vent in such a way that it is almost impossible to see the cone from anywhere, except as a plume of ash and steam in the sky. Although I am told that you can see the cone from a gas station parking lot in Glenwood, I had never found the place. It took a helicopter flight to finally see the vent. From a thousand feet above the ground it wasn't hard to find the volcano at all. During active phases early on, the cone was much higher, but it collapsed and is now primarily a smoking pit. No lava is visible in the daytime, mostly steam, but it is clear where the lavas are going, as will be seen in some coming posts. It is a desolate blasted landscape in the area of the cone, a place that I wouldn't really want to visit up close, even as a geologist (we LAUGH in the face of danger!). 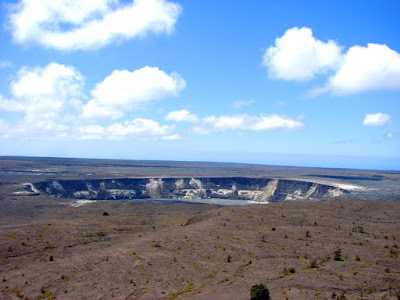 Halemaumau is a pit crater in the caldera of Kilauea volcano on the Big Island. It is reputed to be the home of Pele, the Hawaiian volcano goddess. I'm beginning to think she is watching over us, in a good way. There had been not a whisper of activity in the crater for most of the last quarter century, but in late March 2008 an explosion and collapse of a pit within the pit (which is itself a pit within a bigger pit, kind of like a Bushka doll) showed that activity was resuming. In the last few days, lava has been detected at the bottom of the pit, sloshing back and forth. The ever-present steam plume has begun glowing at night, causing a local sensation as hundreds come up the mountain at night to see the eerie looking orange light. I kinda cheated, and I hope my students don't really notice this. I was done hiking only an hour before sunset, so instead of heading back to Hilo with everyone else, I wandered back to the Jagger Museum, and watched the glow for a bit while the moon rose. It was eeriely beautiful ('eerie' is a common word for the day). I'm so glad to be here and seeing these precious gifts of nature! And even better is that I am able to share the experience with 26 of my students. An early morning drive to the 9,000 foot level on Mauna Kea provides a wonderful view of Mauna Loa, the biggest and tallest mountain on our planet! 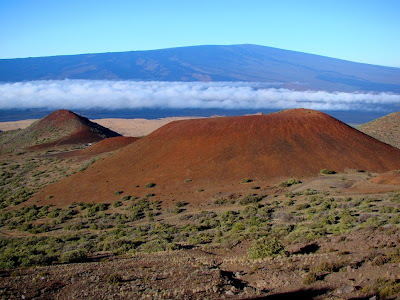 Mauna Loa is the second most active of the Hawaiian volcanoes, having last erupted in 1984. It erupts every few decades, and is capable of doing tremendous damage in a very short time. Her lavas cover 50% of the Big Island, and numerous villages, ancient and modern, have been inundated. A flow on the west flank in 1950 traveled around 6 miles an hour, giving people almost no time to evacuate. The cinder cones in the foreground are late stage alkali basalts from Mauna Kea. Dozens of such cones surround the summit of the volcano, providing a stark contrast to the smooth outline of the Mauna Loa shield. I felt privileged to see such a beautiful, yet menacing sight! In the field this week with 26 students, on the Big Island of Hawaii. Lots to talk about, and I will when I find a bit of time, which hasn't been easy. If you are wondering what you can see from the ground right now, well, I will try and show you! Kilauea volcano is erupting in two places right now, at a cone called Pu'u O'o on the east rift zone, and just lately at Halemaumau, the main caldera at the top of Kilauea. We walked the half-mile journey across the older lava flows to the Hawaii Civil Defence viewing area, which is about 2,000 feet from the ocean entry. This lava has flowed something like 7 miles from Pu'u O'o, and is pouring from a lava tube into the surf. It is a spectacular sight! 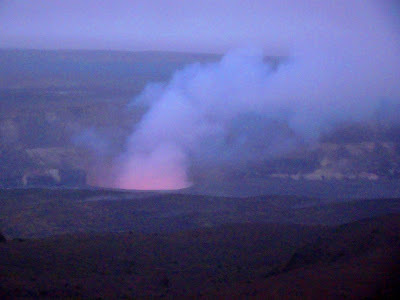 The picture shows a distant view, and a lucky zoom shot that shows flowing lava. It took about 50 attempts to catch visible lava between the steam plumes. Another overflight of a major volcano, taken while we made our way to the Big Island of Hawai'i. Haleakala, on the Hawaiian island of Maui, is the third truly gigantic shield volcano in the island chain. At 10,023 feet, it is shorter than the giants on the Big Island, but it once stood thousands of feet higher. The sheer weight of the volcano depressed the ocean crust by thousands of feet, and the summit may have once hosted glaciers during the ice ages. But no more, for Haleakala is a volcano in its death throes. The mountain has moved off of the Hawaiian hot spot, and the rate and volume of its eruptions is greatly diminished. It may have erupted around 1790, but this date is suspect, and the most recent lava flow may date back to the 1400's. We will visit the volcano in about a week, and I will have more to say about it. Visible in today's picture is the summit area, with two parking lots and "Science City", a cluster of observatories. A group of distinctive cinder cones and lava flows are visible in the top half of the photo, apparently filling a caldera, but as we will find in a future post, this is not actually the case. Took an island hopper from Oahu to the Big Island of Hawai'i, and once again was blessed with some great views of one of the world's great mountains. Interisland flights are short and the planes never quite reach the extreme altitudes of oceanic flights, so the summit of the mountain was directly out the window of the plane instead of far below. Mauna Kea is one of the biggest mountains on the planet, rising some 30,000 over the ocean floor. 13, 796 feet of the mountain rises above sea level. It is a basaltic shield like Mauna Loa, but is in a later stage of development. Mauna Kea is considered to be a generally dormant volcano, having last erupted 4,000 years ago. It lacks the summit caldera typically found on active shields like Mauna Loa or Kilauea due to some late stage eruptions of alkali basalts that filled any calderas and constructed dozens of cinder cones about the summit area. The mountain is notably steeper than nearby Mauna Loa as well. Of all the forms of recreation on the islands, a snowball fight has to seem the least likely, but those white spots near the summit are snow fields! The mountain did in fact possess a glacial icecap during four of the Pleistocene ice ages of the last two million years. The ice was several hundred feet thick and covered around 3o square miles. Even today, permafost seals the ground beneath part of the summit, forming a small lake at 13,200 feet, one of the highest lakes in the United States. As can be seen in the photos above, the summit of Mauna Kea stands above most of the island's weather, and being exceedingly far from any continental sources of air pollution, has some of the clearest, driest and most stable air for astronomical viewing on the planet. This fact explains the collection of sophisticated observatories scattered around the summit. A battle is raging over plans for additional telescopes, as those already constructed were built with little consideration for the environmental damage they inflicted, including a serious mercury spill. Furthermore, the mountain is a sacred place in native Hawaiian culture and is said to be the home of a number of deities. Many feel the summit region has been desecrated by the developments. Pele is a Capricious Goddess...Part Four: What's Next? 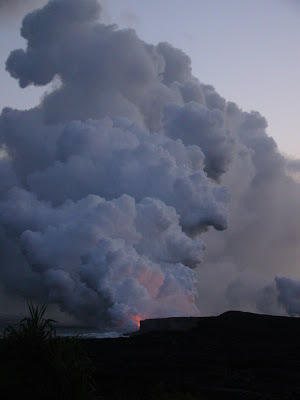 And now part four of my mini-series on the goddess Pele. 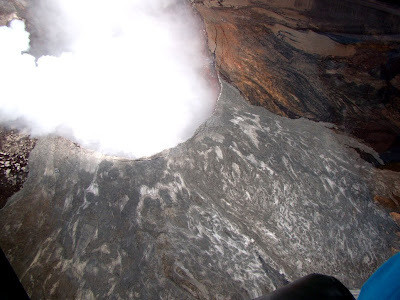 The volcano goddess resides in Halema'uma'u, the pit seen above in a photo from 2006. I've arrived on the islands to prepare the way for my two dozen students, and we are set to visit Pele's realm next week. There has been a great deal of interesting activity of late, and I have hopes that we will be able to witness some aspect of Pele's fire. But as I said before, Pele is a capricious goddess. For many months now, lava has poured from Pu'u O'o, traveling through the lava tube system for 6-7 miles before pouring into the sea. And in March, Pele got upset about something, because for the first time since 1924 she exploded in anger at Halema'uma'u, causing a pit to form in the area below the parking lot at the edge of precipice. Chunks of rock three feet across landed in the viewing area, where gifts are generally offered to the goddess. Lava is bubbling at the bottom of the pit, and vast amounts of steam and sulfur dioxide are pouring out of the vent. Several weeks ago I contacted the Hawaiian Volcanoes Observatory about arranging a tour, and I joked about how the 24 year-long eruption sequence was going to end about June 5, because we were coming to the islands to look at the volcano on June 6. I signed on yesterday to the daily report at HVO, and on the same day the glow in the Halema'uma'u pit was declining, AND the lava tubes had stopped pouring into the sea. Just like that. Just eerie, if you ask me. The report this morning was better. Apparently a blockage in the tube system broke free, and the lava is flowing once more, and the glow in the Halema'uma'u pit is bright again. Message received. In any case, I know to be appreciative of the gift of Pele, whether we see actual lava flows or not. It is a spectacular sight to see, no matter what is happening when you arrive. Students, take note! My third chance to see Pele's beauty came about in 2006 as a result of a family reunion that included a cruise of four of the Hawaiian islands. We arrived a few days early on the off-chance that there would be something to see on the Pu'u O'o flow that continued to erupt over the years. It had been a mostly quiet year, with lava flowing through tubes for seven miles before spilling into the sea. Needless to say, I was in a heap o' trouble when I walked into the hotel lobby at midnight. 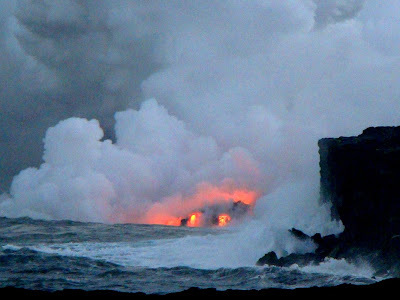 But I can never forget the incredible gift of that magical sight of lava pouring into the sea. Continuing the story from the previous post, I had a second chance to see a volcano in action in 2004. 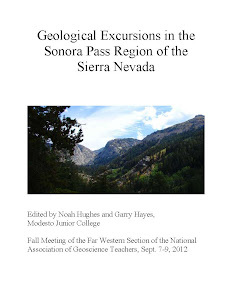 I was the newly elected president of the Far West Section of the National Association of Geoscience Teachers, and for my first conference, I had persuaded someone to sponsor a meeting in Hilo. The volcano had continued to be active over the previous two years and was still going strong as the date of the conference approached. I was thrilled that a bunch of fellow teachers would be able to see an active lava flow! As the final days approached, the activity started to wane. 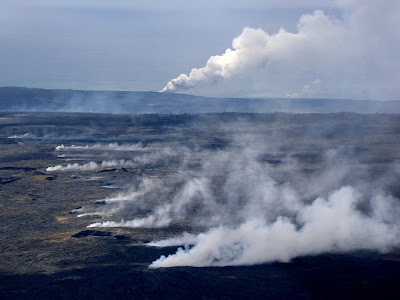 The HVO reported that blockages had started to occur in the upper reaches of the lava tubes that were feeding the ocean entries, and the lava flows were slowing to a trickle. My daughter arrived on the island a day before me, and hiked to see the lava. It was down to a single dribble, no thicker than a pencil, falling into the sea. The next day, I hiked out to the flow as fast as I could, and saw...well, I saw what you can see in the first picture above: steam from a recently ended flow. I searched desperately for any kind of small break out, any sign of active lava, but all there was was steam rising from cracks here and there. All I got for my trouble was a badly scraped arm and palm when I slipped and fell onto a day old lava flow. I was not aware until that day that fresh basalt flows are usually covered with a thin veneer of obsidian (volcanic glass) that gives the lava flow a silvery metallic appearance. The glass starts to break up right away, forming jagged shards that are like small razors lying about the surface. Pele is the volcano goddess on the Hawaiian Island, and she is a powerful deity in the lives of the islanders. Think about it: the only substantial piece of land above sea level for thousands of miles in all directions is the result of volcanic eruptions that built the islands up from ocean crust lying beneath 3 miles of ocean water. All existence on the islands starts with volcanic creation, and all is lost when the volcanoes ultimately die out and fall prey to the waves and weathering. These beliefs demand a certain amount of respect when paying a visit to the islands. 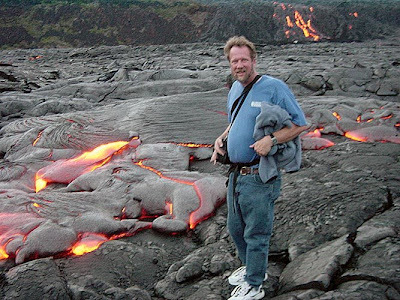 My first trip to the islands was in 2002, and I was full of hope that I would get a chance to see a lava flow, even though there seemed little chance of it from reading the 2002 status reports from the Hawaii Volcanoes Observatory. Lava had not reached the ocean for many months, with activity confined to the region around Pu'u O'o many miles from any roads or trails. Then, just prior to my plane flight, lava started flowing rapidly down the slopes of the shield, and began pouring in a spectacular manner over the Pulama Pali (a 500 foot fault scarp/cliff) and onto the coastal plain...only a mile from the end of Chain of Craters Road! At one point seven streams of lava were pouring over the cliff! And the lava was now crossing the coastal plain on the way to the sea. I was going to see an incredible show! The lava flow had started the largest forest fire to occur in the park in 15 years. And the fire fighters had to close Chain of Craters Road to provide access for their fire-fighting equipment. I was not going to see the lava flow! I was crushed, frustrated beyond reason! Being a Californian, I expect that firefighters work day and night to fight fires, but Hawaii was different. The crews shut down at 5:00 PM, and went home for a nap. The road opened. I, and hundreds of other people drove the road in one long stream of cars, and started hiking over the older flows towards the new flows, now only a quarter mile from the ocean. We could walk right up to the edge of the oncoming flow and feel the intense heat. It was not moving fast, only a few inches a minute, but it was hypnotic. There is nothing quite like standing at the edge of a new creation, knowing that this was how these islands came to exist, one flow after another, after another until they are tens of thousands of feet thick, finally emerging from the sea, providing a platform for the survival of the living flotsam and jetsam that once every few thousand years washed up on the island, and building a unique ecosystem. Back in the dark ages of 18 months ago, I ran a series of blogs on the theme of photography from the "perfect" photo medium of a scratchy glare-filled airliner window. Sometimes one can get lucky and get some decent geological perspectives, and of course, sometimes not! After grouching this morning about lousy airport experiences, we made it onto the plane, and for the first time in five tries I was sitting on the correct side of the plane to get a view of the islands as we made our final approach to Honolulu. So the airliner chronicles return! The top picture shows three of the biggest and tallest mountains on the planet. 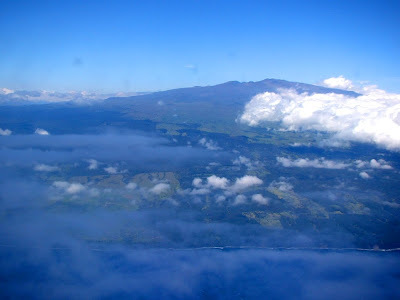 From left to right they are Mauna Kea and Mauna Loa on the Big Island of Hawai'i, and Haleakala on the island of Maui. Tallest? 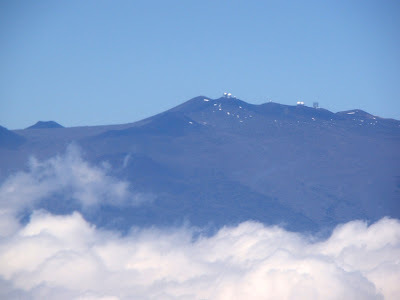 Mauna Kea and Mauna Loa aren't quite 14,000 feet tall above sea level. But, they sit in 17,000 feet of ocean, and as such stand more than 30,000 from their base. And big? The gentle slopes of the volcanoes belie the sheer bulk of these mountains: some 10,000 cubic miles of rock make up the mass of Mauna Loa. With any luck, my students and I will "climb" to the summit of two of these mountains in the coming weeks. The second photo is an iconic mountain from a different angle. 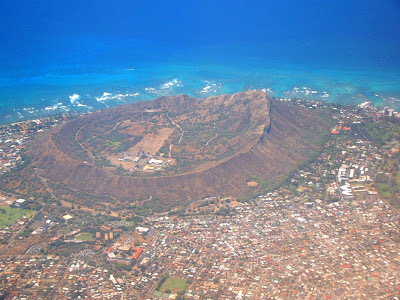 It is Diamond Head, the tuff cone that overlooks Waikiki and Honolulu. 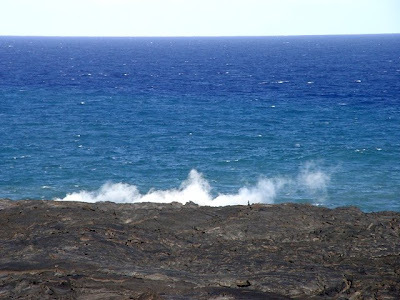 Although the volcanoes making up the island of Oahu are long extinct (2.6 million years old), a series of minor eruptions 200,000 years ago produced a few cones along the coastal plains of the islands. Known to the original Hawaiians as Le Ahi, it got the current name from sailers in the 1800's who thought they had found the precious gems along the flanks of the cone. The sparkling crystals were actually calcite. For what it is worth, Hawaii is rich in one gemstone: peridot. Known to geologists more commonly as olivine, it is a beautiful green mineral that is a main constituent of basalt, the volcanic rock that makes up most of the islands. Well, I'm off to lead a two week field course on the geology and natural history of the Hawaiian Islands. I and the 26 students and volunteers I am traveling with are going to explore three of the main islands: Hawai'i, Maui and Kauai. I've been planning this for more than a year, and at the moment I am sitting in the waiting area at San Jose Airport for my plane to Honolulu. So why Dante's Inferno? Because I'm going to see erupting volcanoes, steam vents, sulfurous hissing vents of hell? Well, no. It's because I love airports, and especially airport security. I love that our government was so traumatized by a single would-be terrorist idiot who tried to burn up his shoes that millions of people every year have to take off their shoes to get through the security lines. I love that some other hapless idiot made up some crap about making liquid explosives that we can no longer take a bottle of water through a security line without causing an 'incident'. That we now have the right to pay $4 for a bottle of water once we are past the security lines. I love airports and all the crazy crap we have to do now. Why do I love airports? Because there is a good chance that going through one may be the worst part of a trip, and I've already suffered through it. Aloha! I promise to be in a better mood for the next post!